In the latest attack on workers’ rights by state government, Indiana became the 23rd “right to work” state when Gov. Mitch Daniels signed the anti-union law on Feb. 1. Thousands of trade unionists and Occupy activists marched outside of the state capitol to denounce the reactionary bill. For weeks the same forces have been rallying in even larger numbers outside the statehouse. Occupiers and union members from throughout the state have mobilized. Right to work laws are intended to deplete union treasuries while creating divisions in the workforce between members and non-members. The result is that in the states that have “right to work laws,” workers make an average of $1500 less per year. Indiana is just the latest example of the bosses’ war against workers’ rights, coming on the heels of massive struggles in Wisconsin and Ohio. In all three states the attacks on unions have been met by a huge outpouring of support for organized labor. In Indiana protesters continuously marched outside the state capitol. As in Wisconsin, Democratic Senators held up a vote by leaving the state and preventing a quorum. To the disappointment of many activists, however, the Democrats returned after Republicans proposed fines of $1000 a day. Apparently for the Democrats, solidarity has its limits! While the Indiana AFL-CIO supported the rallies in Indianapolis, many activists complained that they did not put their full resources into mobilization and instead focused on lobbying, unsuccessfully, a small group of Republican Senators to oppose the bill. Activists are now organizing a series of events in Indianapolis under the banner of “Occupy the Super Bowl.” They intend to use the event to draw attention to the right to work laws through informational pickets and other actions. The NFL Players Union, which has gone on record against right to work, has pledged its support and some NFL players are planning to participate. Some Occupy activists have called for occupations of parks and other direct actions. While it appears the battle in Indiana is lost for the moment on “right to work,” the resistance to it, as in Wisconsin and Ohio, shows that while organized labor might be weakened, it still has the potential to mobilize mass numbers and to attract broad support among working people when it stands up and fights back. 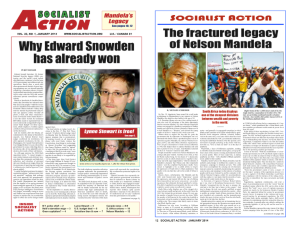 > The article above was written by David Bernt, and first appeared in the February 2012 print edition of Socialist Action newspaper. February 8, 2012 in Labor.